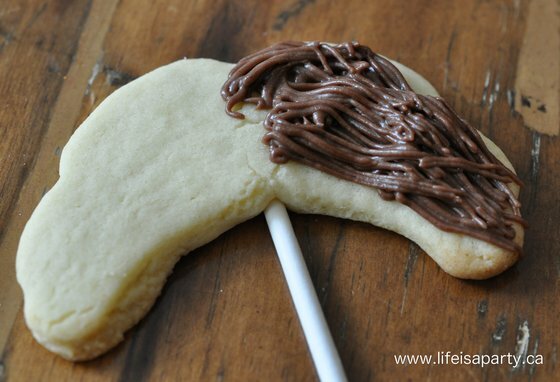 I started out by making my regular sugar cookies, you could use what ever recipe you usually use. 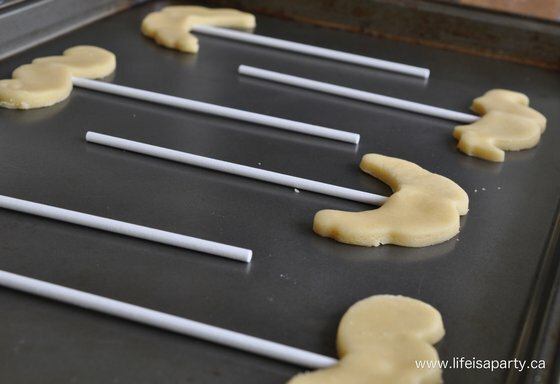 Roll out the dough to be fairly thick, it gives the cookies a little more stability on the lollipop stick. 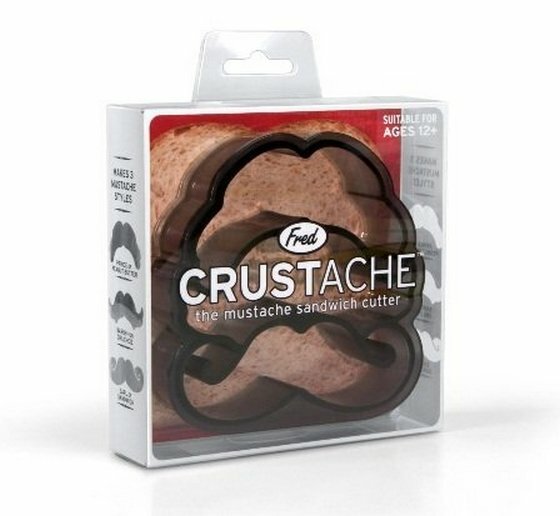 I used the Crustache cutter, which is really for cutting the crust off of sandwiches. 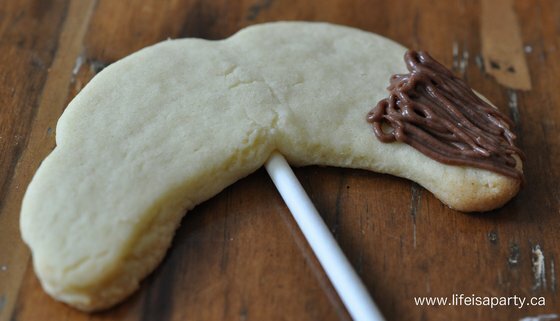 It worked great as a cookie cutter too, and made cutting the cookies really quick, since it’s three cut-outs in one. 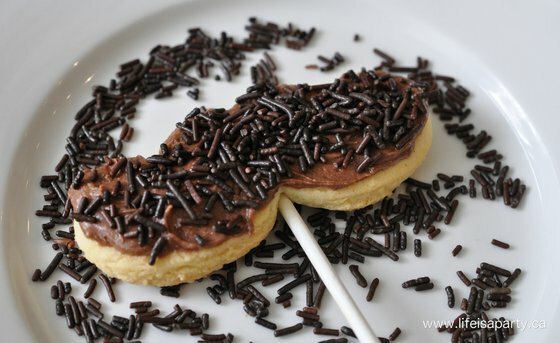 After I cut out the dough, I set a lollipop stick under the middle, placing it as high up as possible on the cookie, and pressing it into the dough slightly. 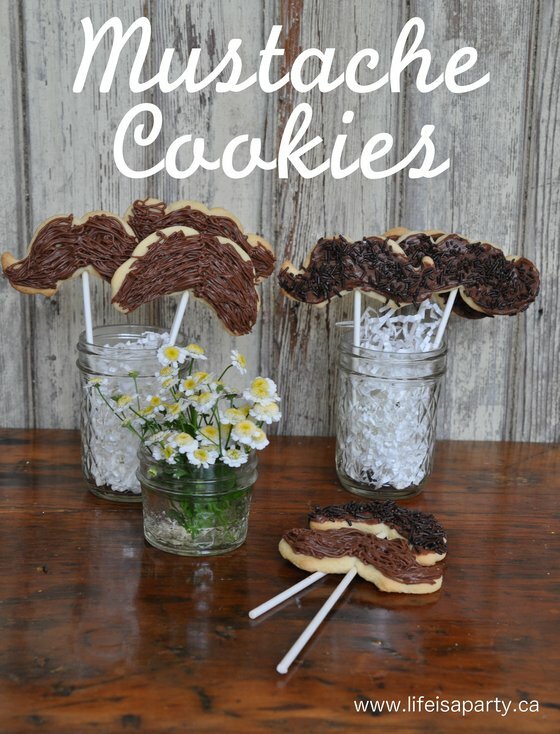 I was a little worried that the baked cookies would be very breakable. I iced them really carefully. I did have a few break during transport to the party, but for the most part they worked out fine. Now for the really fun part, icing the cookies. I made a really simple chocolate icing. 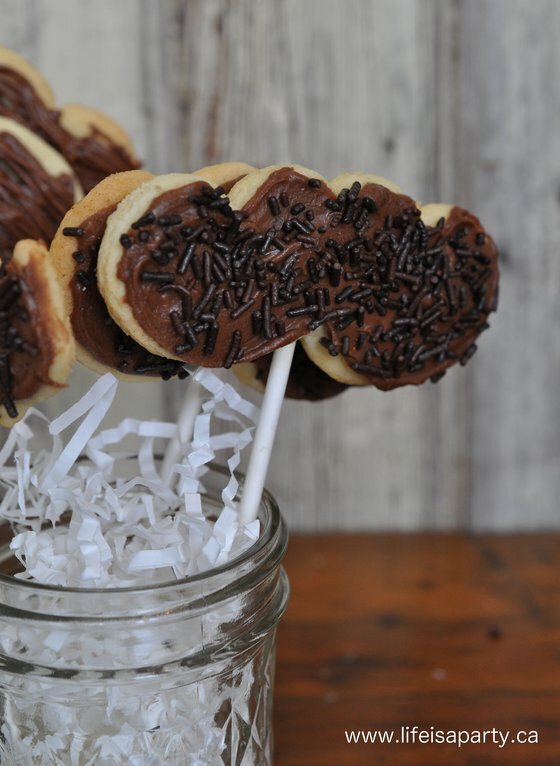 For some I iced the cookies with a knife, and then decorated them with chocolate sprinkles. I really love how whisker-y they looked. 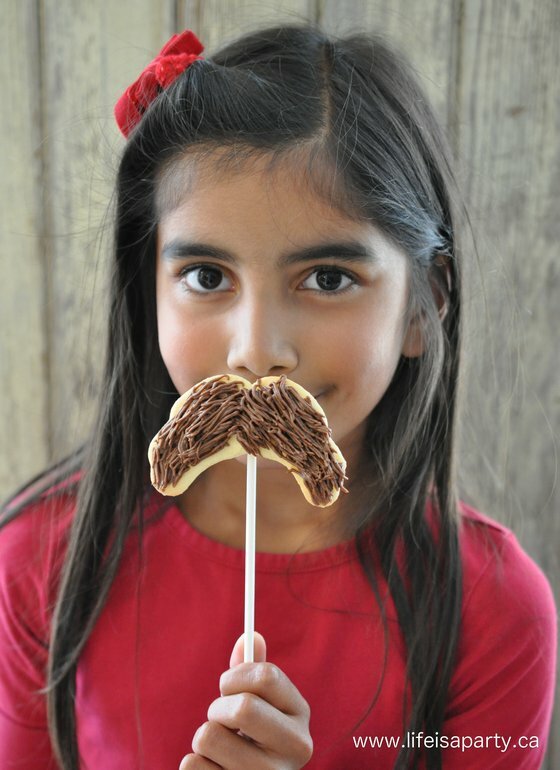 And, as a general rule, all kids LOVE sprinkles, so they’re always a hit with the littles at a party. 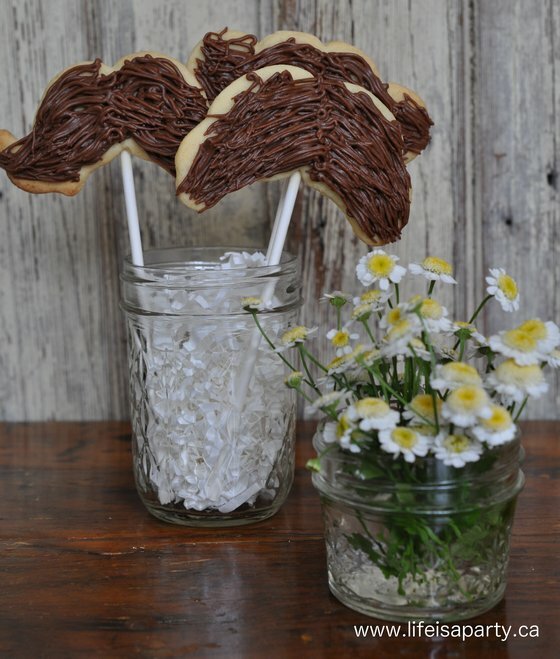 My second idea was to use the grass icing tip -Wilton tip #233 (that I bought to make the Oscar the grouch cupcakes way back here) to make long icing whiskers. There was a little learning curve here. I stared out trying to make short whiskers, but it didn’t look so good. Here’s the method that worked best for me: starting on one side, do the outside set of whiskers, starting about 1/3 of the way from the bottom and dragging the icing to the end. Over lap with a second row, about 2/3 from the bottom, and a final row from the centre. Do the same thing on the other side. I love how they turned out. They were delicious and so cute. 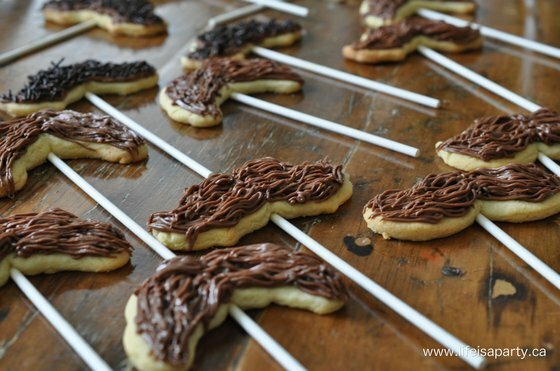 And, who doesn’t look cute with a mustache? 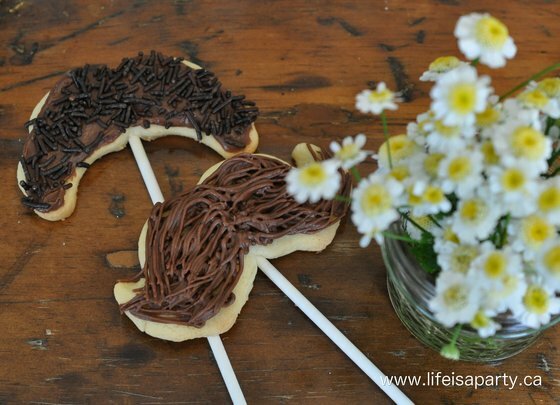 With cookies this good, that double as a disguise if needed, life really is a party!